Leave the stress of one of America's most famous cities to visit something incredible. The journey is already something formidable that you can hardly forget, and at the end you will reach the southernmost point of Florida! Perfect tour for photography lovers but also for fans of history and civilization. The tour will start at your hotel where you will meet your driver guide. Forget the chaos, the crowding, the lights, the traffic in Miami and relax. You will face a purifying journey on the water, you will see wonderful landscapes and breathtaking landscapes before reaching one of the most amazing places in the world ... Key west. Key West is part of the Florida Keys archipelago. 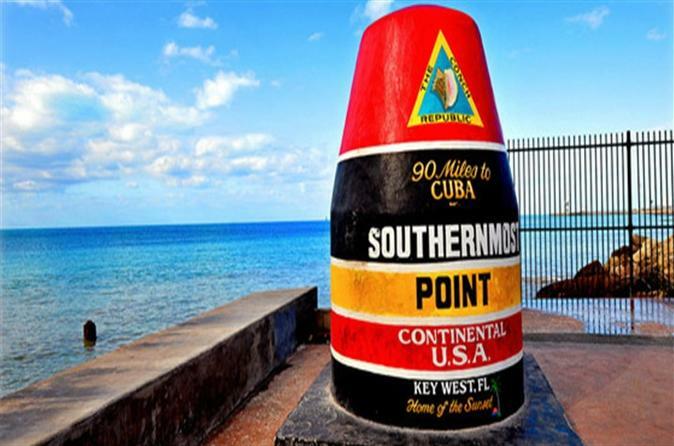 It is also the southernmost point of Florida, about 145 km north of Cuba. Famous for its pastel-colored conch houses, the city is a cruise ship berth, also accessible from the mainland via the Overseas Highway. It is known more for its coral reefs, diving and snorkeling destinations, than for its beaches. During the tour you will decide to visit the Ernest Hemingway House, the Key West Shipwreck Museum or the Truman Little White House. See eclectic architecture drawing from New England, Bahamian, and Victorian styles. At the end of the afternoon, catch the sunset from Mallory Square before departing back for Miami at around 5:30pm.